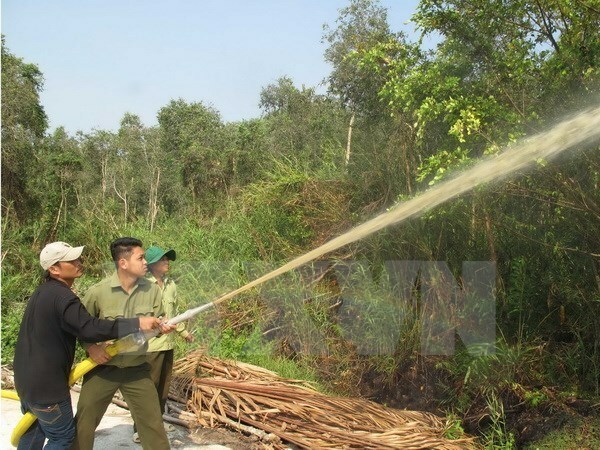 Ca Mau (VNA) – Prolonged heat has put all forest areas in the southern province of Ca Mau in a high fire alert. According to head of the province’s forest management department Le Van Hai, among nearly 45,000 hectares of dried forests, more than 11,000 hectares are on red alert for fires. The provincial steering committee for forest protection and development asked departments, local authorities, forest owners and individuals to implement precautions against fire. For high-risk areas, rangers must be mobilised for active duty around-the-clock during the dry season to tackle fires quickly. Meanwhile, all production and business activities on forest land must follow fire fighting and prevention regulations.